I used to commute this route almost every day. Yet I’m never bored here, as there’s plenty to see. Do as the locals do – hop on your bike (or rent a boat!) and join me on a tour of the Schie. Start at the Mathenesserplein in Delfshaven, one of the most colorful neighborhoods of Rotterdam. Follow the Schie north on the Aelbrechtskade, past the Mevlana Mosque, built by the Turkish community in 2001. 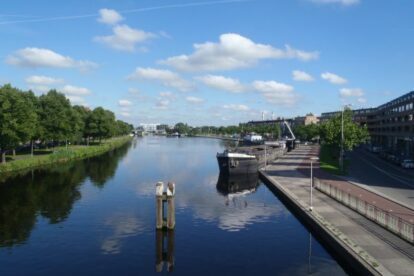 A bit further, across the water, is the Van Nelle Factory. It’s an icon of the 30’s architecture, which I think is one of the most beautiful buildings in Rotterdam. After passing under the A20 highway, watch out for the bird crowds – especially seagulls doing the morning rain dance and dozens of screeching parakeets! Past the 19th-centurish cobbled streets and sunken little dyketop houses of Overschie the city blurs into the surrounding countryside. Our tour ends at the tiny hamlet of Zweth, at the edge of Rotterdam, where I continue towards the medieval towers of Delft to start my workday. See you later!